The end of September saw the completion of our most recent University project. 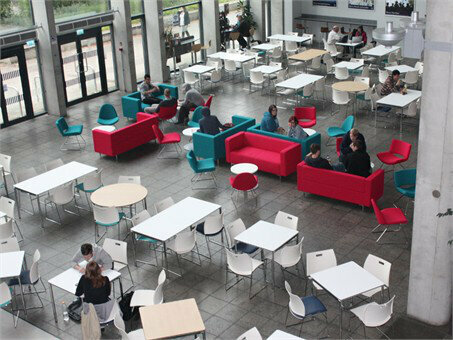 Working alongside Core Architects, Working Environments helped specify and supply furniture for a high density, multi use public space at the heart of the University of Lincoln Brayford Pool campus. The dining areas have tables and chairs from Casala. The light weight multi-purpose stacking Carver chair specified in both polypropylene and with a vinyl seat cushion offer a well designed and contemporary look whilst being exceptional hard wearing. Whilst the Lacrosse folding tables with bumper edges offer the same ethos of design and durability. Both products used together offer the client the ability the flexibly of completely reconfiguring the space very quickly and easily. The central area has a mix of individual soft seating and sofas from Komac in a colourful pallet in a Camira Urban Plus upholstery. The Page and the Jolly chairs sit alongside Raft 2-seater sofas and coffee tables to creating a space to drop down and relax. The atrium at the centre of the main academic building is a large light spacious buzzy space opening up on to the front of the historic Brayford Pool waterfront. The space is used for eating, meeting and relaxing and the aim was to supply a furniture solution that would be flexible enough to deal with different uses, be extremely durable and look great. The space is split into 3 areas with a central soft seating area mirrored either side by 2 large dining spaces.